TalkingCarlton • View topic - Celebrity Carlton Fans? Post subject: Re: Celebrity Carlton Fans? Picture was from Festival Hall...March 1977. Alice was touring Australia the same time as ABBA. Here they are together in Perth. Has anyone mentioned alice cooper? I have an image of him in carlton jumper ..... or is that just me losing my mind? thank you bondi blue for finding my mind...…………. 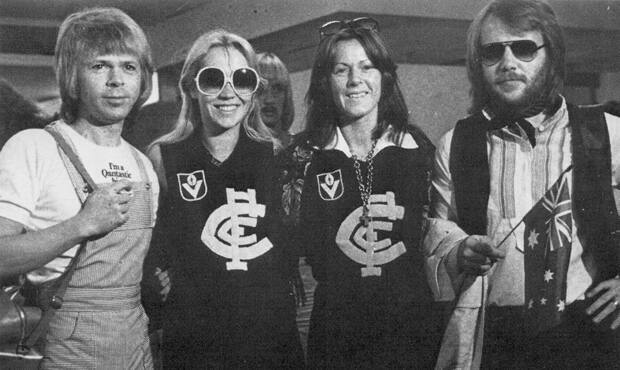 And as we know, ABBA were given Carlton jumpers too. In 1977 Keith McKenzie was a man on a mission. Carlton jumpers for absolutely everyone! Did Alice Cooper have #18 on his back? The Australian has lived his whole life following the navy blue, and Blues star Marc Murphy was even his inspiration for his WWE ring name. Murphy keeps a close eye on the Blues’, waking up in the early hours of the morning each week to see them play. While Murphy is dreaming of WWE gold at Super Show-Down, the Carlton fanatic feels the Blues can also be contending for titles in the near future. “I actually have an app on my phone where I watch the games. Even if it’s 3am or 5.45am,” Murphy explained. Would've made sense for the club to bring him and Alexa Bliss to the club for some promotion, maybe even an appearance at the B&F. OK, we now have a Carlton tragic WWE Cruiserweight champion on our books. Sadly he'll likely be on a plane back to the States right now. Missed opportunity CFC. A SATURDAY in spring at the MCG. For boyhood Bluebagger Buddy Murphy, that may have previously held the dream of an AFL premiership. However, October 6 2018 marked Murphy’s crowning moment. In front of 70,000 people, the hometown hero became the first Australian to win WWE gold. Carlton’s influence on the newest Cruiserweight Champion is evident. His real name Matthew Adams, Buddy’s ‘ring name’ takes inspiration from Carlton’s own Marc Murphy. At Ikon Park for the first time in 15 years on Friday, Murphy said there was no choice involved for him and his brother. “I’m a massive fan. I was made to become a Carlton fan by the old man,” Murphy said. Buddy’ also highlighted Craig Bradley, Chris Judd, Stephen Kernahan, Matthew Lappin, Stephen Silvagni and now Patrick Cripps as his favourite Blues. However, he can’t look past Carlton’s No.3 — the number which features on the back of Buddy's new Blues guernsey. “Not surprisingly, Marc Murphy was a bit of an inspiration for me, which has now come into my wrestling career,” Buddy said. “Patrick Cripps is an absolute gun and he’s probably my favourite at the moment. Due to fly back to the other side of the world this weekend, he said he’d continue to keep tabs on the Blues — and try to make his fellow WWE Superstars bound by blue. “I try and get the other WWE Superstars and my fiancé to watch it, but for some reason they like the NFL,” Murphy said. This is so good Don! I was at the G a couple of weeks back for the WWE and even saw him wrestle once at The Prince back in 2012. Fun times. Seriously, who is in charge of our social media now?? It's bloody marvellous! I stood behind him in the ticket queue at Etihad/Marvel a couple of years ago in his full Carlton regalia.